As you cruise around Vancouver Island and the neighbouring Gulf Islands of Canada’s west coast, you won’t be able to ignore the diverse population of birds soaring above you or swimming beside your vessel. Vancouver Island is a birdwatcher’s paradise, with so many different types flocking to and from the island throughout the year, both on land and in the sea. Here is a quick look at some of the birds you’re likely to spot while boating in the Pacific Northwest around Vancouver Island. Have your binoculars and camera ready! There are many ducks to be found close to the shoreline surrounding Vancouver Island, including sawbill ducks known for their saw-toothed bills which are ideal for catching fish underwater. 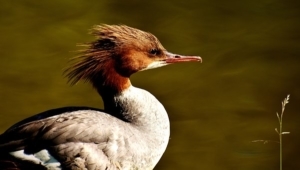 Mergansers, which are commonly found in winter, are the most common sawbill duck found around the island. There are also Harlequins (spring and summer breeders), Eiders, Scoters, and Goldeneyes, which migrate in late fall and early spring. There are four main types of loons living around Vancouver Island: the Common Loon (as found on Canada’s $1 coins called “Loonies”), Pacific Loon, Yellow-billed Loon, and Red-Throated Loon. 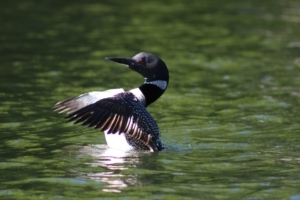 Loons are aquatic birds that are larger than ducks but smaller than geese. They are hardy birds seen year-round in our waters, but especially in the winter. Known for soaring great distances despite their incredible size, the albatross is hard to miss. Albatrosses are large seabirds that originated in the Atlantic but are now common around the Pacific Ocean. Albatrosses found in our region are the Black-footed (most common), Laysan, and Short-tailed Albatrosses. Back in the day, sailors regarded the Albatross as a symbol of good luck. If you’re out far enough from the shore in your boat, you might spot a shearwater or two, which are known to follow whales and fishermen around in search of an easy catch. The Pacific Ocean is home to several species of shearwaters, including the Short-Tailed, Sooty, Flesh-Footed, Pink-Footed and Buller’s shearwaters. Storm Petrels are known for their tube-shaped beaks. They are similar to shearwaters, but don’t fly so close to the waves. There are two main types of Storm Petrels in our region: the Fork-tailed Storm Petrel and the Leach’s Storm Petrel. Cormorants are large birds with distinctive hooked bills used to catch fish as they dive beneath the sea’s surface. Cormorants found around Vancouver Island include the Double-Crested, Pelagic, and Brandt’s Cormorant. You’ll find plovers wading along the shoreline feeding on insects, crustaceans, and worms. The main plover species living around Vancouver Island include the Pacific Golden, American Golden, Black-Bellied, and Killdeer plovers. Sandpipers also wade along the shorelines hunting for food. They have long bills, which set them apart from plovers. Vancouver Island is home to sandpipers like Godwits, Turnstones, Shanks, Tattlers, Dowitchers, and Calidrids. Skuas and jaegers are strong, “scrappy” birds that like to take their food from gulls and other seabirds. Species in the region include the Pomarine Jaeger, Long-Tailed Jaeger, Parasitic Jaeger, and South Polar Skua. These closely related seabirds are all known to be clumsy on land, but fast underwater. With their black and white feathers and upright posture, these birds may remind you of penguins, but there is no relation. Notable species to look out for while boating are the Tufted Puffin, Cassin’s Auklet Common Murre, Ancient Murrelet, and endangered Marbled Murrelet. Considered very much to be coastal birds, gulls are practically synonymous with the sea, and there is certainly no shortage of gulls living around Vancouver Island. The Western Gull is the most common gull in the region, but there are many others, like the Ring-Billed Gull, Herring Gull, Heermann’s Gull, Glaucous-Winged Gull, Slaty-Backed Gull, and Common (Mew) Gull. Skimmers are black and white long-winged birds with bright reddish bills. They closely resemble terns, who forage for food from dusk until dawn. Skimmers are easily recognizable and have several other names, including scissor-bill, shearwater, seadog, cutwater, razorbill, flood gull, and stormgull. Terns are long-distance migrants closely related to gulls and skimmers – the biggest difference being they are slimmer birds and have longer tails and shorter legs. Around Vancouver Island there are three main species of terns to spot: the Arctic Tern, Common Tern, and Caspian Tern. There are several raptors (birds of prey) circling Vancouver Island at any given time, including the mighty Bald Eagle – builders of the largest tree nests in the world. 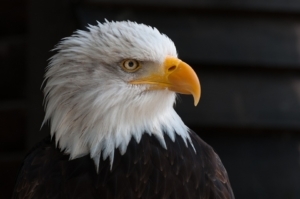 The bald eagle hunts near large bodies of water and nests in old-growth forests. They especially enjoy flying near rivers during the fall salmon spawning season. No matter how many times you see an eagle, it’s hard not to stop what you’re doing and stare. Other raptors to admire around the Island include the Peregrine Falcon, the Osprey (found near any body of water), the Turkey Vulture (found inland around garbage heaps), and the Red-Tailed Hawk – a bird that prefers open fields to the open sea. Belted Kingfishers are commonly found year-round along the streams and shorelines around the island. Known as much for their loud, rattling calls as they are for their large heads, shaggy crests, and big bills, the American Belted Kingfisher was prominently featured on the Canadian $5 bill in 1986, which is why he might look a little familiar. The black oystercatcher is a distinctive bird with its bright red beak, pink legs, and pure black feathers. Find oystercatchers hanging out in pairs during low tide or near protected shorelines and jetties. Contrary to their name, oystercatchers don’t eat Vancouver Island oysters – they prefer other shellfish like clams and mussels. There is a unique subspecies of the Great Blue Heron living year-round on Vancouver Island. 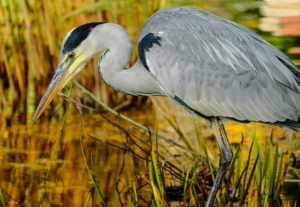 Unlike other herons, the ones here do not migrate; instead they breed in colonies in marshes and wetlands. From Quadra Island all the way down to Victoria, you can find Herons patiently waiting on floating beds of kelp, waiting in anticipation for their next meal. This list is just a partial list of the bird species you’re likely to spot on Canada’s west coast. You can find a few of them, such as Harlequin Ducks and Great Blue Herons at Robert’s Bay Bird Sanctuary, which is just steps away from us here at Van Isle Marina. Or, if you’re heading in-land, try any of these South Vancouver Island hikes to catch a glimpse of even more bird species. At Van Isle Marina, we have decades of experience out on the water and have spotted plenty of the birds listed above, particularly from the decks of our motor boats and yachts. Come and see us – we are your Pacific Northwest boating experts and will be happy to show you around our docks! For more pics and information about all the seabirds of Vancouver Island, visit Discover Vancouver Island. When is a Boat a Yacht?